The centerpiece of White Lies’ fifth album, the aptly titled Five, is the mini-epic “Time to Give,” a seven-minute long ode to marriage dysfunction. The song paces around patiently, utterly unhurried while frontman Harry McVeigh delivers lines such as “Sell the house but not the home” and “Kids grow up and they’ll pin the blame on you,” before our protagonist takes a hit of some really strong midlife crisis weed and ventures into a synthesizer fantasia. It’s one thing to costume yourself as a buttoned up, sharp-dressing ensemble in the vein of post-punk revivalists Editors or 21st century sophistipop group The National, it’s another thing entirely to actually live it. A decade into their career, White Lies have lived it. The band’s existential melancholy is draped in new-wave signifiers not because '80s music is fun, but because these are the kinds of lads whose formative nights were spent debauching in various dingy '80s nights and whose identities were shaped by the hungover memories. 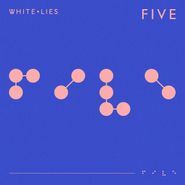 Five is the sound of realizing your youth is firmly behind you, and White Lies are quickly finding themselves to be the old guys at the club. Sure, the kids might not understand this one. Good thing the hooks are here for everybody.